It is truly clandestine. Everyone knows it exists, even if it's not mentioned in the telephone directory, in official books or in public speeches. There are no road signs to it. And yet it's very well-known. It receives countless visits, it's searched for, found, looked at and admired. It's “the Sarajevo tunnel”. It exists but, officially, it's as if it doesn't. 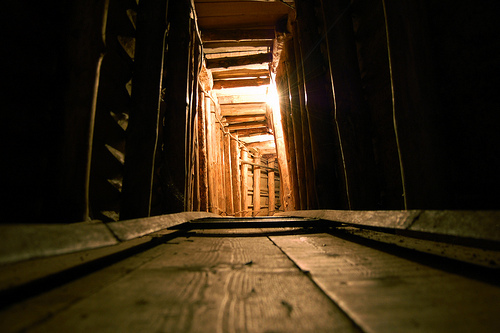 For the people of Sarajevo “the tunnel” is the symbol of courage and survival. For the Serbs of Bosnia Herzegovina it's the place where Serbs were killed and tortured. The other day a small group of admirers and supporters who have not forgotten what the tunnel of Sarajevo meant during the war, met to celebrate it's eighteenth anniversary. It was quite a modest ceremony, much lower key than its fame and historical importance would today imply. July 30th 1993, at 20.40, the hands of the two people digging underground, one towards the city and the other towards the suburb of Hrasnica, touched under the runway of Sarajevo airport. A brief hug and then, hurriedly, they secured the last few metres of wall and reinforced the roof of that hole later known and remembered as “the tunnel of Sarajevo” or “the tunnel of the war” or “the tunnel of salvation”. At that moment the besieged Sarajevo opened its only safe line to the rest of the world. That same night, through the tunnel, twelve tons of goods were transported into the city and a brigade of soldiers passed in the opposite direction to help the units fighting on Mount Igman where a big battle was going on. It's an exaggeration to call it a tunnel: in reality it's a cavity 760 metres long, 1 metre 20 cm wide, a metre and a half high, just in some places 1 metre 80 cm. Between March and July in 1993 more than 200 people in absolute secrecy and medieval conditions had dug it out with their hands, spades and pick-axes by the light of lanterns. The tunnel was built only 50 metres from the front line, under the nose of the international forces, who would have prevented its construction had they known, and naturally it was a secret from the enemy. It connected the two free areas of the city, Dobrinja and Butmir. That's why in code it was known as D-B. People laughed at that because those letters were the same as the ones used for the secret service in the old Yugoslavia. To understand the importance of the tunnel in that period, it's worth remembering Sarajevo in the winter of 1993: sealed off by Serb nationalists who kept it under a medieval siege with 600 pieces of artillery in position on the surrounding mountains, without electricity, running water or gas, in freezing cold houses where the telephones didn't work, three hundred thousand inhabitants of a modern city endured hunger, bombardments and sniper fire. From this most, if not all, wanted to escape. They slipped out through the sewer pipes, running across mine fields, over the frozen river, or hidden in the rare lorries to bring humanitarian aid to the city. The more daring, or the more desperate, crossed the runway of Sarajevo airport. The chances of survival on that route were 50%. Uncertainty dogged the desperate fugitives to the end. The runway was crossed at night, running in total darkness, not only because there was no lighting, but because, once over the runway they couldn't tell if they would finish in the arms of friends or foe, that is in land controlled by Bosnians or Serbs. My sister managed it. At the fifth attempt. On the four preceding times she, together with the small group with which she was trying to escape, was stopped and taken back to the city centre. The airport was controlled by the international forces who prevented the citizens from escaping. The foreign troops policed the runway with, among other things, infra-red rays. As soon as they noticed fugitives they approached with armoured cars and pointed their headlights at them. Their “prey”, like an animal lit up in the dark, stopped from fear, turned to stone from terror. Caught in the headlights the fugitives became easy targets for the assailants. Over 250 people died this way. The common people dreamed of the tunnel, but the authorities were also considering it. Certainly not to empty Sarajevo of its inhabitants, but to bear the siege better, facilitate manoeuvres, bring food and medicine into the town and take arms in both directions. Digging it under the airport was a necessity, a desperate move. It was planned by two competent young Sarajevan engineers: Nedzad Brankovic and Fadil Sero. The structure, which from inside looked like a hole, withstood the tons which landed on the runway above for the whole of the war. These two were later awarded medals. Unfortunately Nedzad Brankovic, after the war, did not maintain his reputation. He was involved in a scandal, having obtained an appartment illegally, and the common people forced him to resign his post of Prime Minister of the Federation of Bosnia Herzegovina. The tunnel was entered through a nondescript house near the airport belonging to the Kolar family. The secrecy of the project set a limit on the work and the initial metres were dug by a trustworthy few. Work proceeded very slowly, the men digging while seated on the ground or kneeling. Various problems arose: what to do with the material dug out so as not to make the Serbs suspicious, how to deal with the water which filled the hole, how to get hold of the material required to secure the ceiling and walls, while all the time bombardments interrupted the work. In March 1993 the work stopped. So the President, Alija Izetbegovic, intervened in person. Work began again, with men from the Bosnian army working shifts over 24 hours a day. Then the miners from central Bosnia arrived. Eight hours' work were paid with one packet of cigarettes which were scarce and costly (€15 a packet) and highly prized not only by smokers but also because they were also used in bartering. From the completed tunnel a total of 2,300 cubic metres of earth were removed, 170 cubic metres of wood and 45 tons of metal were inserted. Entry into the tunnel was controlled by the Bosnian army and a permit was required to enter and leave the city by this underground route. However transit each way was continuous and every day between three and four thousand people and thirty tons of various goods passed through the tunnel. At first people went in groups, of twenty to a thousand people. On average it took two hours to cover those 760 metres. When the underground passage had been reinforced small wagons, like the ones used in mines, were brought in. They were pushed by men and it was a hard job as there were bends and inclines in the corridor, the deepest point being 5 metres under the runway. Each wagon was loaded with 400 kilos of goods. The people going through carried on average 50 kilos in backpacks and by hand. An unnamed citizen of Sarajevo even managed to carry 105 kilos on his back, mostly onions and potatoes. For the President Izetbegovic a “presidential chair” was installed. Seeing it today it's comic to hear such a pitiful object given such a pompous title. The first military items to go through the tunnel were home-made bombs, prepared in the blockaded town using any metal that could be found. “Road sign posts” wrote my sister proudly in a letter to me. The tunnel's first business deal involved bringing eggs into the besieged city, but much more lucrative was transporting alcohol and petrol. This was the commerce of the rich and powerful, those who could pay and knew who to corrupt. Officially alcohol could not be taken through the tunnel, but once more than two hundred litres of alcohol were discovered in the bags of the “Bosna” basketball team's players as they returned from a tournament. Like cigarettes and coffee, alcohol was a bargaining tool in the besieged Sarajevo. Through the tunnel went soldiers, common people, politicians, journalists, artists. General Jovo Divjak has a lasting memory: twelve stitches in his head. On his way through he hit his head on the low ceiling. The first foreigner to go through was the American Ambassador, Victor Jaković. There's a scene in the short film “(A)torzija” - “Torsion” (screenplay by Abdulah Sidran, prize winner at the 2003 Berlin Film Festival) at the tunnel entrance. Some members of a choir are awaiting their turn outside the tunnel, a cow starts to give birth, the calf is turned round in the uterus and the choir start to sing to help the birth because one of them remembered that music can alleviate pain. The effect of music on the despairing was what inspired the invitation to the famous Croat tenor, Krunoslav Cigoj to perform at the Christmas concert in Sarajevo in 1994. He suffered from claustrophobia and, after the concert which was broadcast by CNN, Cigoj said the underground passage was one of the hardest moments in his life. The privilege of passing through the tunnel was also reserved for three goats, the fate of one of which I know. My colleague and friend, Fadila, originally from Prijedor in northern Bosnia, heard that all the men in her family had ended up in concentration camps set up by the Serbs in that area (Omarska, Keraterm and Trnopolje). For these relatives she could do nothing and for this reason Fadila had decided to help someone who was in need, this being a Bosnian tradition and ancient belief. The orphanage of Zenica had several children and, although Zenica is only half an hour from Sarajevo in peace time, during the war various permits, courage and a whole day were required to get there. Via radio operators, as telephones didn't work, Fadila asked a colleague working in the orphanage to help her choose a child. Her colleague suggested some nice healthy children. There was a boy, a two year old, who neither spoke nor walked; he was very thin and seemed autistic. Fadila chose him and sent her husband to fetch him. He brought the child through the tunnel to a Sarajevo under siege and then went back through the tunnel to get a goat which they kept on the balcony in the middle of Sarajevo. A goat, where hunger was rife and shortages the norm, was worth a fortune. For us, goat's milk has properties which are considered miraculous. With this goat's milk and other cures they got this child back on his feet. Today he's a great boy and the pride of his family. In 1994 the Serbs got to know about the tunnel. General Ratko Mladić protested to the international forces and asked Unprofor, in vain, to close it. Officially Unprofor did not know, or did not want to know, of its existence; in dealings with the Bosnian military the underground passage was referred to as “the tunnel which isn't”. So the besiegers tried to destroy it. They tried to deviate the Željeznica river to flood it and intensified their bombing in the area where they presumed the entrances were. In one of these bombardments twelve people were killed while waiting in line to go through. After the war the tunnel was abandoned and most of it is in ruins. Thanks to the Kolar family, through whose house the tunnel was entered, today 25 metres can be visited. On their own initiative the Kolars have set up a small museum with objects connected to the place. The Bosnian authorities have made several attempts to declare the tunnel a national monument, but the Bosnian Serbs are against this. Recently in the Federal Parliament Slavko Jovičić said that “under the runway there was not a tunnel of salvation but rather a torture gallery for the liquidation of the Serbs and a passage for contraband and arms trafficking.”According to the President of the Association of Prisoners in the Srpska Republic, Branislav Dukić, “medical experts have shown that more than 149 types of torture were inflicted on Serbs in this tunnel. Sarajevo University Professor, Hidajet Repovac, a cultural sociologist, thinks differently: “ The tunnel had only one entrance and one exit. Anyone could go through it and no-one asked those in transit if they were Serbs, Croats or Bosnians. So the tunnel saved not only Muslims,” he concludes. Today the tunnel of Sarajevo shares in the destiny of all that splits Bosnia Herzegovina. It reflects the divisions, hostilities and contradictions of a fragmented country and its peoples who insist on the things which estrange and divide them. That's why that underground structure, which survived the war, now hardly scrapes along. However the visitors who come to Sarajevo are not interested in family quarrels. Most tourists, official delegations and important personalities ask to see it because they consider the tunnel of Sarajevo an historical monument, like “Check point Charlie” in Berlin, the hiding place of Anna Frank in Amsterdam, the “Cu Chi” galleries in Vietnam and other similar places. All historical locations, part of that history that we want at least to touch.